The ZVOX SB400 is a precision made, finely tuned home theater system in a single, stylish aluminum cabinet. Inside you'll find three high performance speakers (including a center speaker), a built-in powered subwoofer and a 118-watt digital amplifier. The ZVOX Mega Bass system uses advanced digital contouring to deliver astonishing bass from the slim (3.2”) cabinet. 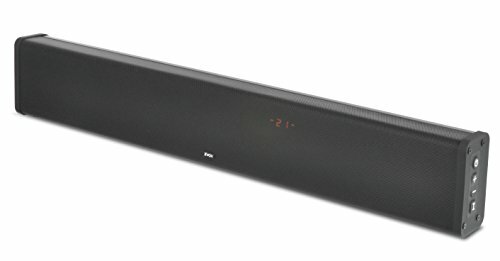 Unlike most sound bars, no external subwoofer is needed. Phase Cue virtual surround creates three-dimensional home theater sound from one cabinet. And the revolutionary AccuVoice system uses hearing aid technology to deliver incredibly clear voices - on movies, TV shows or sporting events. Output Leveling tames loud commercials. aptX Bluetooth provides wireless connectivity with your phone or tablet so you can stream music through the SB400. It's easy to program the SB400 so it will work with virtually any remote control. If you want great home theater sound, designer styling and really useful features - but without all the complications - the SB400 is a great option. Room-filling 3D sound from a single anodized aluminum cabinet. Built-in subwoofer with Mega Bass produces great bass without an external subwoofer. Multiple inputs make it simple to add Chrome cast Audio for multi-zone Wi-Fi streaming music.